iTapuih.com - Pembahasan: Soal UN SMA 2018 Beserta File Download. Ujian Nasional yang hanya tinggal menghitung hari membuat kita harus benar-benar berjuang untuk menghadapinya. Salah satunya dengan cara mencari pembahasan Ujian Nasional tahun-tahun sebelumnya. Take it easy! Blog ini sudah menyediakan pembahasan tersebut. Pada kesempatan kali ini saya akan membagikan Pembahasan Soal UN Bahasa Inggris SMA 2018. Saya sengaja membagikan soal-soal UN Bahasa Inggris beserta kunci jawaban, dengan harapan adik-adik kelas 12 SMA yang akan menghadapi UN bisa menggali kemampuan dalam menghadapi Ujian Nasional yang sudah semakin mendekat. Pembahasan ini juga bisa didownload dalam format PDF. 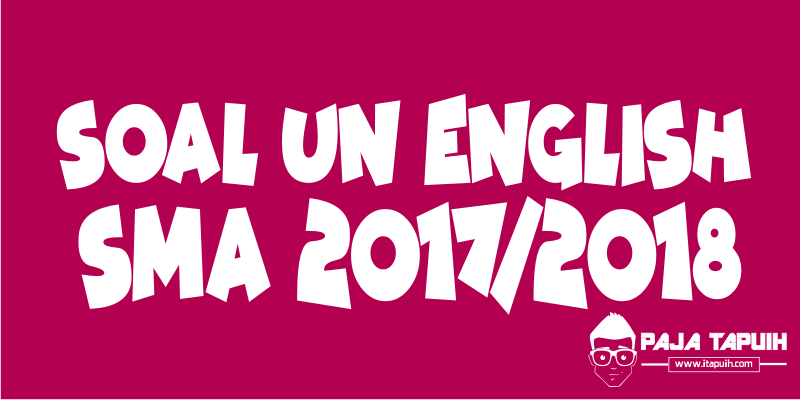 Silahkan Download Pembahasan Soal UN Bahasa Inggris SMA 2018. Latihan soal berikut ini sengaja dimulai dari nomor 16, karena untuk no 1 sampai 15 merupakan bagian Listening. Anda juga bisa mengunjungi laman tersebut dengan mengklik link berikut ini. The following text is for questions 16 to 18. Burning a CD allows you to take music from one CD and transfer it onto another CD. This process is possible with any computer that has a CD driver, but it is easier on a computer that can run two CDs at once. Either way, you can copy all your music from one CD to the next. Here is how to copy from one CD to another, using one and two CD drivers. 1. Insert the CD from which you want to burn music into your computer’s CD tray. Insert a blank CD into your computer’s second CD tray. 2. Open windows media player and wait for it to recognize the CD. 3. Click the “burn” option at the top of Windows Media Player. Drag the songs you want from the list of your songs into the area on the right labeled “Burn List”. 4. Choose the blank CD onto which you want to burn your song. This can be done at the top of the Burn List Menu. 5. Click the “Start Burn” button when you have all the song you want for the CD added to the Burn List. Wait for your computer to finish the CD, then take both of the CDs out. 16 What is the topic of the text? C. Copying a compact disc. D. Choosing the blank CD. E. Inserting the CD into computer. 17. What should we do after click the “burn” option at the top of Windows Media Player? A. Choose the blank CD onto which you want to burn your song. B. Open windows media player and wait for it to recognize the CD. C. Wait for your computer to finish the CD, then take both CDs out. D. Click the “Start Burn” button when you have all the songs you want from the CD. E. Drag the songs from the list of Songs into the area on the right labeled “Burn List”. The following text is for questions 19 to 21. 19. What is the topic of the passage? B. Explaining the behavior of rabbit. C. Describing the rabbit as a toy pet. D. Explaining about rabbit’s population. E. Describing how to take care of rabbit. The following text is for questions 22 and 23. 23. What can be inferred from the text? The following text is for questions 24 to 27. Please come early so that we can find a comfortable seat for you. Your presence will be acknowledged as our loyal customers and you are definitely on the list. Please let us know if you will attend the event. 24. The purpose of the text is to…. 25. What is the main idea of paragraph 1? A. The company invited the customers to attend inauguration ceremony. 26. What is the passage about? The underlined word is closest in meaning to…. 28. What is the writer’s intention to write the text? D. To show his disappointment to teacher. E. To tell his expectation to be the winner. 29. Why did the writer feel sad before the competition? C. Her teacher was not fair to her. 30. From the text it can be concluded that …. A. Practice makes performance go well. 31. "…..I was nervous, I showed my best performances on the stage." The sentences can be connected by which of the following words? A. Pokedates was launched by Project Fixup. 34. How people earn PokeDates? A. By referring a computer. B. By paying US$20 per date. C. By signing up to service. D. By going on a date. 35. “… it all comes down to human chemistry, we wanted to cut out all the steps between signing up to a service and going on a date”. Which of the following completes the sentence best? 36. What is the topic of the text? A. How to make creamy mushroom potatoes. B. The materials of creamy mushroom potatoes. C. Steps of cleaning creamy mushroom potatoes. D. How to produce heat and simmer soybean and potatoes. E. How to prepare ingredients for creamy mushroom. 38. According to the text when should we add sliced mushroom? A. After adding soybean milk, black pepper, salt & potatoes. B. After frying onions, garlic, celery & green pepper. C. As soon as we heat and simmer onion, garlic and green pepper. D. Before pouring the oil and margarine. E. Before we serve the meal. 39. 1 tb parsley – chopped. 40. What does the text tell us about? A. The forest fire and the effect in Indonesia. 41. What can we infer from the text? A. Many people suffered from serious illness because of the haze. 44. How can people be powerful to earn money online? 45. What is main idea of paragraph 3? Tigers are the largest member of the cat family and are renowned for their power and strength. There were eight tiger subspecies at one time, but there became extinct during the 20th century. Over the last 100 years, hunting and forest destruction have reduced tiger’s populations from hundreds of thousands of animals to perhaps fewer than 2.500. Tigers are hunted as trophies, and also for the body parts that are used in traditional Chinese medicine. All five remaining tigers subspecies and endangered, and many protection programs are in place. Tigers live alone and aggressively scent- mark large territories to keep their rivals away. They are powerful nocturnal hunters that travel many miles to find buffalo, deer, wild pigs, and other large mammals. Tigers use their distinctive coats as camouflage. Despite their fearsome reputation, most tigers avoid humans; however a few do become dangerous man eaters. 49. What is paragraph 2 about? 50. We know that from the text that a compromise …. Selamat belajar, semoga postingan tentang Latihan Soal UN Bahasa Inggris SMA 2018 Beserta Pembahasan bisa bermanfaat dan jangan lupa share ya.